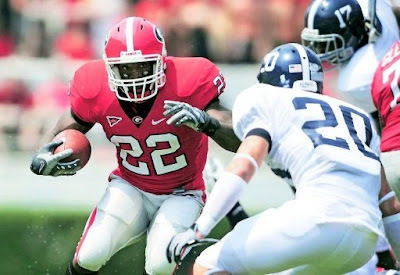 The wait for Georgia's replacement for Knowshon Moreno's vacated tailback position is over. Georgia head coach Mark Richt has named Richard Samuel as the Bulldogs starting tailback. Samuel is a 6'2", 218 pound sophomore who saw only limited duty last year behind Moreno. In fact he carried the ball only 26 times for 133 yards. He also missed spring drills due to wrist surgery. But he has won the starting job outright this summer with his bruising style. He has battled four other tailbacks, and Richt has not ruled out the possibility that the Bulldogs might operate as a 'tailback by committee'. That remains to be seen, and probably won't be sorted out until later in the season. But for now, Samuel will be the first on the field, and he hopes the one on the field the most.